You’ve heard plenty about it, and now you can actually pursue getting a REAL ID. The Act established minimum security standards for state-issued driver's licenses and identification cards and prohibits Federal agencies from accepting for official purposes licenses and identification cards from states that do not meet these standards. States across the country have made considerable progress in meeting this key recommendation of the 9/11 Commission and every state has a more secure driver's license today than before the passage of the Act. Beginning October 1, 2020, Pennsylvanians will need a REAL ID-compliant driver’s license, photo ID card, or another form of federally-acceptable identification (such as a valid passport or military ID) to board a domestic commercial flight or enter a federal building or military installation that requires ID. REAL IDs will be available next month to Pennsylvanians who want them. I have given several presentations about REAL ID. The information from my presentation can be found here. 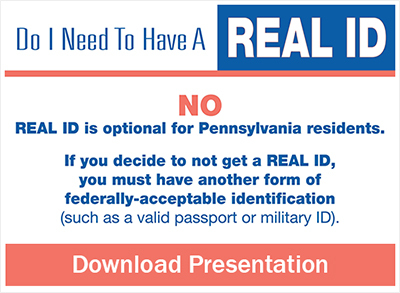 You can apply for REAL ID here or you can apply in-person at the Berks County DMV (530 East Lancaster Avenue, Shillington) and it will be mailed to you. My office will hold another Aging Parent Conference on Thursday, September 5, at Muhlenberg Middle School, 801 East Bellevue Avenue. Like last year’s conference, our program is aimed to serve the adults who already are caring for their elderly parents and those concerned about doing so in the near future and will cover the gamut of aging issues. We’ll also have more of a focus on how you can plan for your own care. Stay tuned for more details! It’s a privilege to be your state senator, so it is important to me to be in touch with you. I really like face-to-face meetings but understand that in this busy world, sometimes that isn’t possible. Feel free to call my office to ask questions or make suggestions. Also, you may connect with me through my pages on Facebook and Twitter. Please follow me for regular updates and comments about what’s happening in the district and in Harrisburg.